This medical mayo stand is height adjustable with easy locking knob. 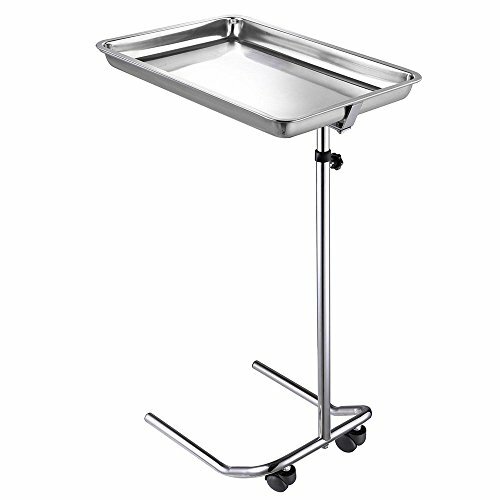 It comes with a removable stainless steel tray, and dual wheel nylon casters for mobility. Height adjustment range: 32 3/5" - 55 1/2"
Base dimensions: 19 ¼" x 15 3/8"
Weight capacity: Approx. 22 lbs. The sale of this item may be subject to regulation by the U.S. Food and Drug Administration as well as state and local regulatory agencies. Please not bid on this item unless you are an authorized purchaser. If the item is subject to FDA regulations, we will verify your status as an authorized purchaser of this item prior to shipping of the item.